Nigerian troops have attacked a village in the creeks of the oil-rich Niger Delta and recovered surface-to-air missiles, a spokesman has said. Soldiers were looking for militants who attacked a military camp on Saturday, the spokesman said. A militant group told journalists the army fired indiscriminately when they entered the village of Agge, killing women and children. But the army denies anyone was killed in the operation. 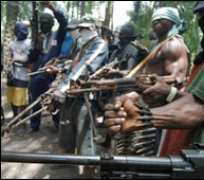 Oil militants in the region say they are fighting to ensure that Niger Delta residents see more benefits of the oil wealth. But correspondents say some are criminal gangs, making money from ransom payments and stealing oil. A spokesman for the Joint Task Force in the Delta State capital Warri said they recovered two missiles from a weapons cache they found in the village. "We are working with insiders from the village who told us about the weapons and showed us where to go," said Lt Col Rade Abubakar. Other military sources told the BBC when they approached the village militants opened fire and the troops fired back. The Movement for the Emancipation of the Niger Delta (Mend) issued a statement to journalists condemning the soldiers' attack. "Shots from heavy calibre machineguns were being fired as they were approaching the community not considering the safety of innocent victims of stray bullets," spokesman Jomo Gbomo said. It is impossible to verify either claim at present. Militants attacked a military camp in Bomadi on Saturday and militant sources told the BBC 11 soldiers were killed and a gunboat was stolen. But Lt Col Abubakar denied any casualties.